I’ve had the most amazing time at this wonderful company, I’ve worked on super interesting projects, have learned A LOT and have met incredible people. They say that Google years are similar to dog years: it seems like it’s 7 years in 1 – but at the same time, the really fly by without you noticing. So after two wonderfully intense and uncomfortably exciting years I’ve decided to go on another adventure and took a job at another company. 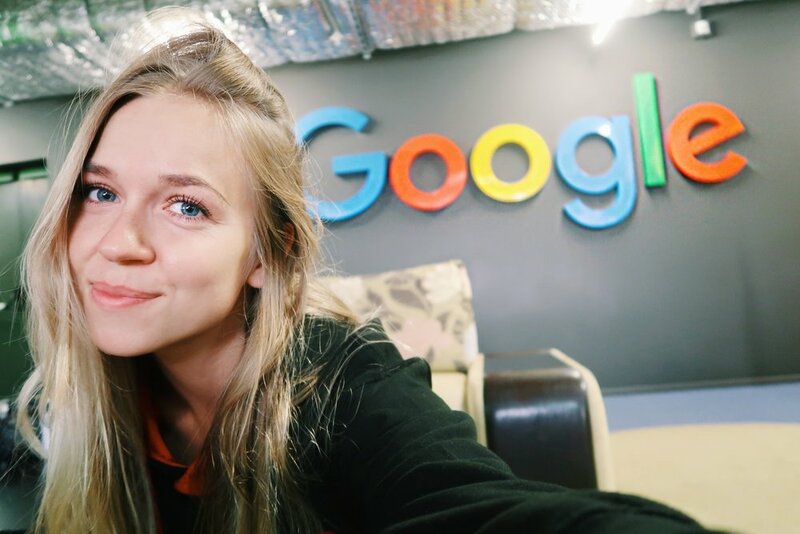 My last day at Google was November 6th and it was very emotional because I love my team and simply everyone at that office (you can watch the vlog on my YouTube channel!). So it’s been incredible and I would recommend working at that amazing company to anyone, so back to the application process! Head to the Google Careers website and explore! They have so many opportunities in so many different offices, so use keywords to search for what you’re interested in and don’t forget to check out the offices! You can filter job searches by locations, types of roles, experience, education level etc. and they even break it down for you into categories if you’re not sure where to start. So find what interests you and read the role description carefully: what skills and qualifications are they asking for? If they are asking for a lot of work experience the role might be more senior, which will be harder to get – be realistic about what your experience and skills. If you’re looking for an internship, make sure that you look at the page for Students – they outline the application process pretty well out there and I’ve heard great things about the internship programs at Google. In fact, a few of my colleagues used to be interns, so a lot of them end up getting full time positions after graduating! Myth: Google only hires software engineers – again, check the fields of work page! So this is the tricky part, not only Google hires only the most talented people, but it also receives A TON of applications. So be realistic that you’re competing against a lot of people. Make sure that you understand what the role that you’re applying for is about – maybe do some additional research or reach out to people on LinkedIn with a similar title to ask them what they do. If you think that you have the right skills to do the job, the next step would be updating your CV: it should mention all of the relevant skills and experience in it. Use keywords that are used on the job description and look at some additional ways to improve your CV (I love the Muse for that kind of stuff!). And the Google Careers website also has tips on how to apply. Tip: if you know someone at Google, ask them to refer you. Getting someone to refer you ensures that HR will look at your CV and will give you a response – they will either ask you to set up a call or say no. But at least they will respond this way for sure. The referral process has recently been super simplified and shouldn’t take too long for a Googler. And all you will need to provide is your CV with all your updated contact info (email + phone number). In my last experience of referring someone, the system would then send the person an email with a tool where they could enter positions that they are interested in. From what I remember it was up to 3 – but you don’t have to enter them all. If you can’t get referred by a Googler, then just click the blue “Apply” button on the top right corner and submit all of the information about yourself! Cover letters are optional and I didn’t write one for the application that got me the job – just saying. Yay! You got the interview, congratulations!! This is definitely an achievement, so take a moment to celebrate. Once you’re done, start preparing for the interviews, because they won’t be super easy. Google hires the most talented people and you will need to prove that you’re one of them. The first interview is usually a call with an HR person – they will ask you a couple of general questions (nothing too specific about the role yet) and might talk you through the interview and hiring process. If you go onto the next stage, this person will be your main point of contact for any questions you may have. In fact people at the Google HR are awesome, make sure you ask them questions about your upcoming interviews and how you can prepare for them. Myth: Google asks brain teaser questions at their interviews – don’t worry there will be none of those famous golf ball questions! Google gives some guidelines on how to prepare for the interviews – and if you’re applying for a technical role, make sure to go through the bottom section of that page! General cognitive ability: They want to see how you think, so talk through your thinking process and explain how you reach the conclusions/decisions that you do. Leadership: Think about all of your experience that proves that you’re an empathetic leader who thinks about the community around you and empowers it to develop. Role-related knowledge: Do you have the right skills and knowledge for the role? Googleyness: Will you fit into the Google culture? Do you share the same values? In my case (it was a non-technical interview), most questions were situational, something like: imagine you’re in the role and you have problem x – how would you solve it? The final stage if you’ve gone through all of the interviews, is the Committee and Executive review. I won’t go into too many details about it, but it’s basically how Google makes decisions on literally every single hire. You can read more about it here or ask your lovely HR point of contact! If you didn’t make it..
Don’t give up!! It took me half a year of applications to get there! Sometimes it felt like my applications are not even getting there and on other times I got simply got rejected. But persistency pays off and if this is your dream, it’s definitely worth it. What did you think about this post? Was it helpful? Are you thinking of applying soon? Let me know in the comments below! Hi 🙂 loved your article! What do you mean when you say it took you half a year of applications? You applied several times? If I understand well, you didn’t pass a technical interview even though you applied for a technical role (soft eng for example)?